I know what you are thinking – cookies, really Nora? It’s the start of a new year and you are going to throw some cookies my way? Oh yes, my fabulous readers I sure am! Let me clarify though, these oatmeal breakfast cookies are not ones laden with sugar, copious amounts of oil or butter and empty carbs. 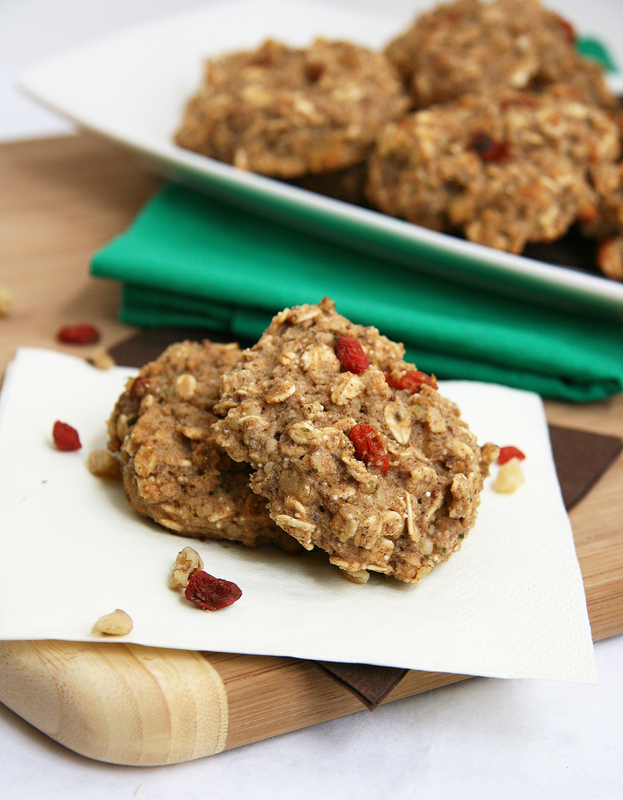 These cookies are basically portable oatmeal – lightly sweetened with a nice dose of healthy fats, superfoods and fiber. I adapted these oatmeal cookies from Sonia’s version at The Healthy Foodie, who continually inspires me, my creativity and my eats here on Natural Noshing. I took one look at those cookies and said – “Yep, no question – I am making these this week” and I proceeded to make them…not once, not twice but THREE times with different variations since she has posted them last month. Ridiculous, no? 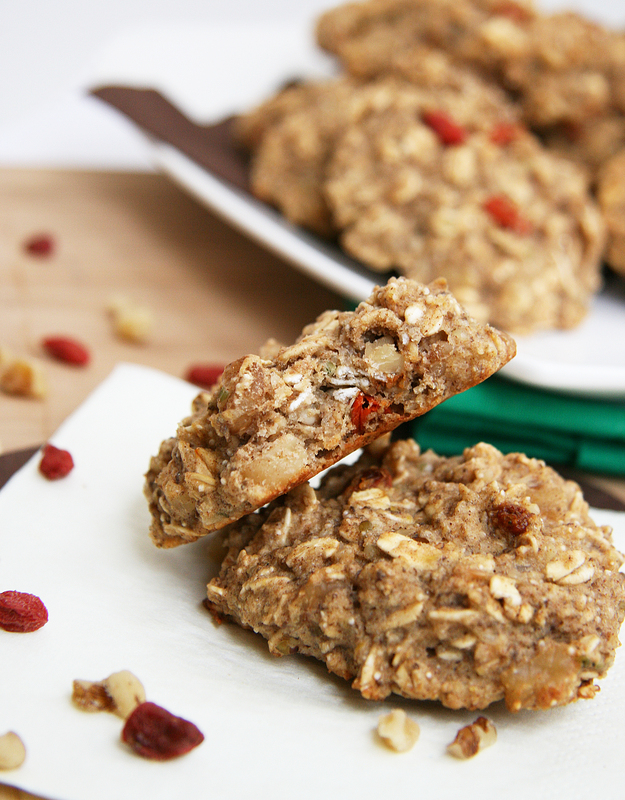 I think not since these no sugar added cookies are the perfect way to start your day! I keep these refrigerated and grab a few on the way out the door to the gym for a quick post-workout snack or for a speedy breakfast or a light treat after a meal. These aren’t crispy cookies but I’ve found that you can put them in the toaster oven on “light/low” for a few minutes and they have a lightly crispy exterior with the chewy texture I love so much. 1. Preheat the oven to 400F. Line one large baking sheet with parchment paper. 2. In a blender or a food processor, mix all the wet ingredients together until smooth and set aside. 3. In a large mixing bowl, combine all the dry ingredients together. 4. Add blended wet ingredients to dry ingredients and mix delicately to combine. 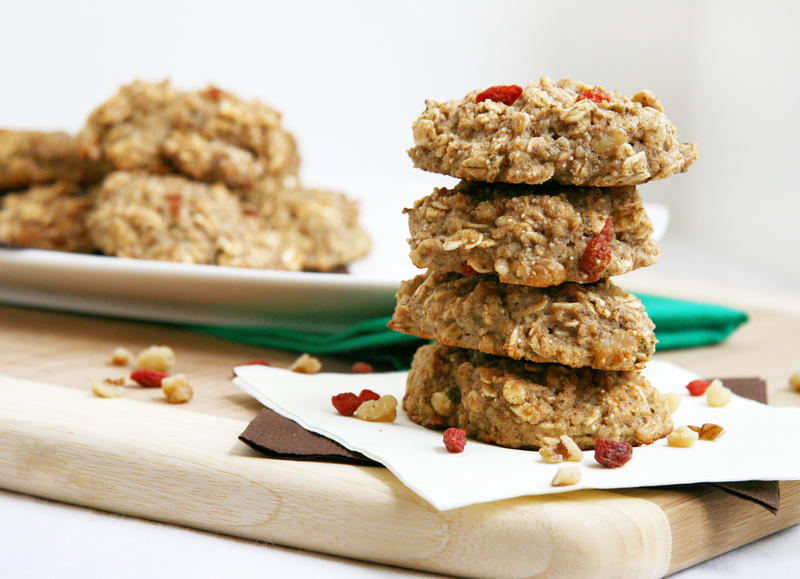 Fold in hemp seeds, goji and walnuts. 5. Drop by tablepoonfuls onto prepared baking sheet. *You can leave the cookies as is if you want them looking like little mounds, or you can flatten them down some with the back of your spoon. 6. Bake for 10 to 13 minutes, depending on how flat (or unflat) you made your cookies, or until they look just slightly undercooked. Cool completely on a cooling rack then transfer to an airtight container. Store in the refrigerator, where the cookies will keep for up to a week and enjoy! Recipe Notes: For a sweeter cookie, feel free to add 2-4 Tbsp of coconut sugar or use honey/agave/maple syrup and decrease the cottage cheese/coconut milk by 2 Tbsp. Oh I completely agree, chocolate so makes everything better!!!! I am a big but fan too so I would just leave them in and add in some chocolate hehe! I love the idea of portable oatmeal. I think you should name these that 🙂 They sound really good, actually–I’m digging the ingredients list as well. Let me ask you this, what does the chia do to your recipes? Do you just like the flavor of it or does it act more like a binder? Or both? I’ll have to make a 100% vegan version and dub them portable oatmeal in your honor 🙂 I’ll work on that! Lots of yummy ingredients and it’s flexible too! OOOOOH did you really make them THREE times already???? I’m planning on making a new batch this week-end and I am debating whether I should try a new flavor combo or go back to the original “raisin” version and try and improve it some. I think I’ll choose the latter. I’m really glad my recipe inspired you, Nora. You sure honored it in your version. I really wish I could just grab a cookie from my computer screen. They look very yummy. And now I really want to try them with loads of goji berries. Yes ma’am! Three batches – but I basically halved yours as reflected above. I made 2 batches of the superfood version with goji’s and another with cranberries and pecans 🙂 both delicious! I thought the superfood version was most appropriate as a “breakfast cookie” so that’s the one I posted 🙂 Thanks for the inspiration! OH and I am already loving Erin! SO glad we got introduced through you! 🙂 Thanks for that too! It’s great to hear from you BryAnn! I am so happy you stopped by to say hello and let me know you enjoyed these cookies 🙂 Music to my ears! thank you for your kind words, I really appreciate it! Any idea on how many calories one cookie has approximately? Hi, I was wondering if I could sub equal amount of mashed banana for applesauce as I am following a low FODMAP’s diet and need to avoid apples? Thanks for your recipes they all look great! I made a batch of these this morning, using coconut milk as a substitute for the cottage cheese (I’m allergic to dairy). They were so good, I just made a double batch, subbing pureed garbanzo beans in place of the coconut milk. They turned out delicious! Added in dates, raisins, and sunflower seeds 🙂 Thank you for the great recipe! I shared it with our gym’s facebook site, and I think people are really enjoying it there, too.